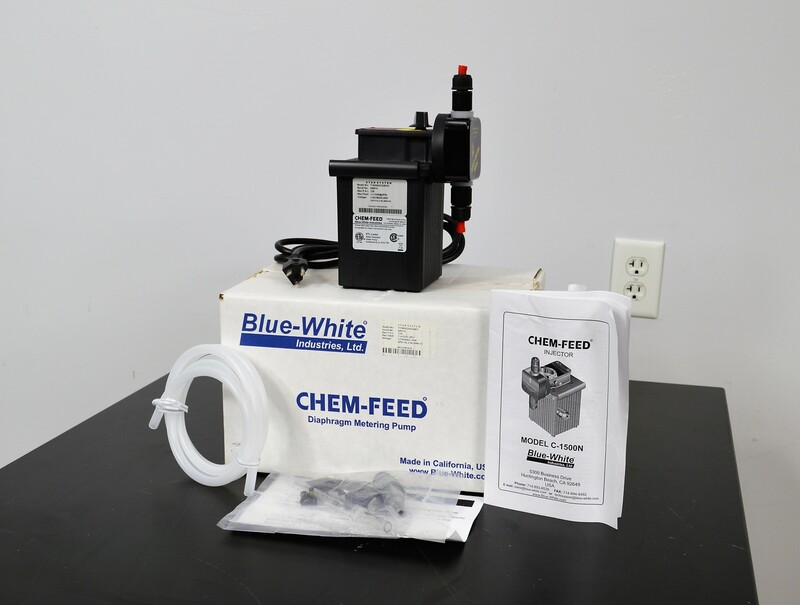 Blue White C-1500N Chem-Feed Injector Diaphragm Pump Single Head 9.5 GPH 125 PSI . New Life Scientific, Inc. The C-1500N chem feed pump was acquired as a new instrument in the original packaging. The manufacturer's box, padding, accessories (photographed), and publication are included with this purchase. This product was not tested, because it appears suitable for application and unworn by use. - Built with a superior Pump Head design, CHEM-FEED® Diaphragm Metering Pumps are built to last. Double ball valve inlet and outlet cartridge type ceramic check valves ensure fluid keeps moving, no fouling. All ball bearing, permanently lubricated gear motor for smooth, quiet, powerful operation.